Frisco, TEXAS (March 24, 2015) – In collaboration with the Frisco Independent School District, Frisco Square Property Owners Association presents the 6th Annual Arts in the Square, benefitting the Frisco Education Foundation and Frisco Family Services. 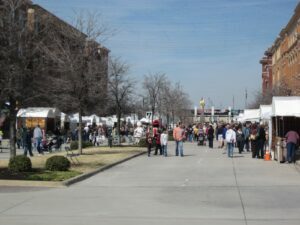 Frisco Square transforms into an outdoor fine arts and crafts gallery during Arts in the Square, March 28-29, 2015 from 11:00 a.m. to 6:00 p.m. each day, with free admission and parking. In previous years, Arts in the Square hosted over 20,000 visitors who enjoyed shopping for art, listening to live music, strolling on the square while visiting each artist’s booth, making their own art, and eating at one of the many fine restaurants located in Frisco Square. In addition to providing the community with a high-quality cultural event, the festival proceeds benefit local charity partners: Frisco Family Services, which helps members of our community facing hunger, homelessness and other urgent needs, and Frisco Education Foundation, which provides college scholarships, educational programs, and educator grants to students and staff in the Frisco Independent School District.